Happy Easter Weekend! Our spring break has officially begun and I'm looking forward to a week of no alarm clocks, homemade waffles for breakfast, and lots of fun. I'm thankful that this year my spring break is the same week as my girls so that we get to spend lots of quality time together! Today, I'm rounding up what I'm currently loving and honestly, it was really hard to narrow it down to just eight picks this week. 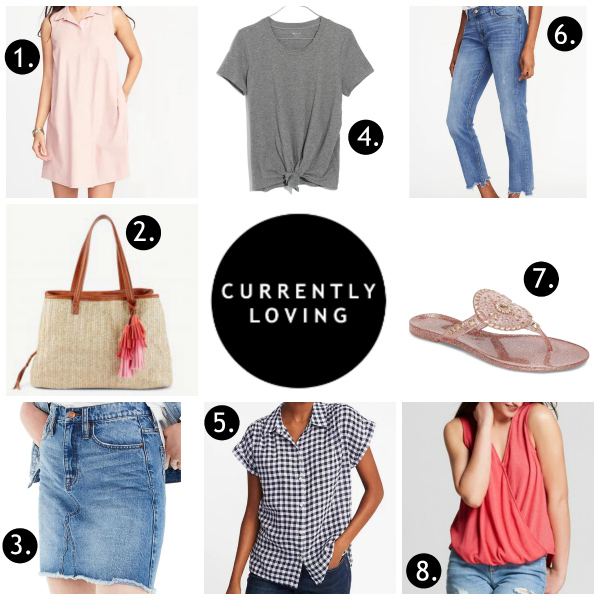 I found so many cute, budget friendly items for spring and summer this week! I think that straw bag has got to be my absolute favorite! 1. Dress | I love a good swing dress and this one is so perfect for spring. Throw on a denim jacket for cooler mornings and you are good to go! 2. Bag | Like I mentioned above, this bag is my favorite pick this week! I love the structured style of this straw bag and the cute tassels add the perfect pop of color. 3. Denim Skirt | I have been hunting for a great denim skirt for spring and summer. This one is high on my list! I love it! 4. Gray Tee | Is there such a thing as too many gray tees?! I certainly hope not because I gray tees are my weaknesses. I might have close to too many but I think I need this one too. 5. Gingham Top | Gingham print is a classic. Every spring, I feel like it pops back up everywhere and I'm glad because it's one of my very favorite prints. This shirt is on my wish list! 6. Jeans | I love a good pair of boyfriend jeans and the hem on this pair makes them different from any pair that I already own. Old Navy has been my go-to for denim lately! 7. Jelly Sandals | I have wanted a pair of these jelly sandals for awhile and I love this pretty rose gold pair! They are too cute! 8. Wrap Top | A wrap top is always a flattering choice and this one is less than $20 plus it comes in several different colors. Such a great throw on and go top to pair with white jeans or jean shorts! I hope you have a great weekend! Happy Easter!